If you’re a mobile device maker nowadays, and particularly if you build Android-based devices, you’re in an increasingly crowded marketplace. Standing out from the crowd is harder than ever. If you’re a software house, the challenge is no easier. You need people to buy the devices running the platform you build for in order to convince enough devs to bring their app across to the platform too – which encourages more people to buy devices using that platform. It’s a virtuous circle. If you’re a software and hardware maker, the job is twice as hard, and twice as important. If you can’t get people on board and bag some exclusive content or services for your devices and platform it will likely tank. Just look at HP’s WebOS debarcle, despite actually being a decent OS. Clearly, this hasn’t escaped Samsung’s attention; as a company with its own (and Intel-backed) Tizen OS efforts trundling along and a major role in increasing the number of Android devices in the wild, it’s important that the company has a good relationship with its developers. 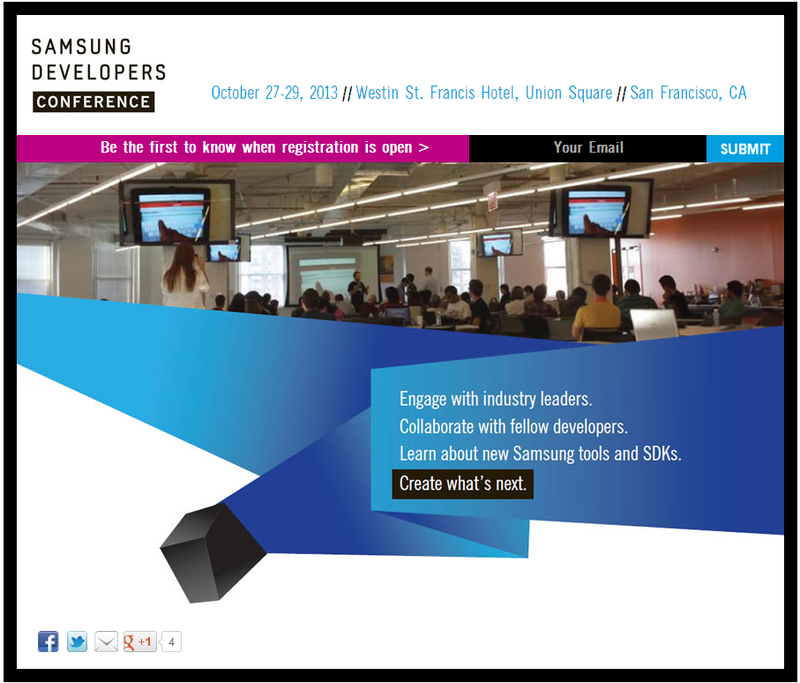 As such, its first Samsung Developer Conference (to be held in San Francisco’s Westin St. Francis Hotel from 27 – 29 October) will be far more important than whatever news comes out of it. While the focus may well be on Android this year, the event will help forge relationships with developer communities that could pay dividends if Tizen was ever to become its primary platform for smartphones. In a way, Samsung is already late to this party. Apple, Google and Microsoft — notably all behemoths spanning different industries — already have their own developers conferences to spur development for their platforms and devices. BlackBerry is another company that knows the value of ecosystem support, it has been holding a series of events around the world to promote BlackBerry 10, although this is driven more by the critical situation regarding its floundering in the consumer smartphone market rather than purely a growth plan. While Samsung could be seen as being late to the DevCon party — after all what else screams market-leading like thousands of people in the same place all there to find out more about your software — it’s actually one of the few Android makers that offers one which will go a long way in ensuring it stands out from the masses. Samsung’s recognition of software being as, if not more, important than hardware have been there to see for some time. Iterative hardware updates to a flagship device in favor of getting custom services on board is always a telltale sign that they’re thinking about the future rather than the now – it’s far easier to wow consumers with radically different hardware than genuinely useful services. More interestingly perhaps, Samsung is an Android developer and doesn’t strictly have to be doing this to spur development on the platform, but in hosting its own developer event it’s really beginning to distance itself from being just another Android maker and starting to lay down the roots of a potentially fruitful, direct, relationship with developers around the world.